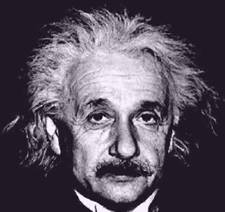 Albert Einstein is perhaps the most recognizable name of all scientists and mathematicians. He is widely considered to be one of the most intelligent people in the world's history, and the name "Einstein" is even routinely used in place of the word "genius." Einstein was born into a Jewish family in Germany, but he spent time in Italy, Switzerland, and eventually the United States. He was married twice. The first time to Mileva Maric in 1903. Together they had two sons and a daughter but their marriage was ended in 1919. That same year Einstein got remarried to Elsa Löwenthal, who was actually his cousin. Elsa died in 1936. Einstein himself passed away on April 18, 1955 in Princeton, New Jersey, where he was residing at the time. His research served as a foundation for what has become modern day physics. In particular, his ideas changed people's views on time, space and matter. As you can see, not all of his work is related to science and math. Eistein's later works, My Philosophy and Out of My Later Years are considered to be some of his most important writing. So do you agree, is Einstein the most famous of all the Famous Math People? Return from Albert Einstein to other Famous Math People.